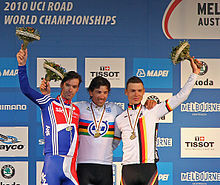 The 2010 UCI Road World Championships took place in Geelong and Melbourne, Australia, over 5 days from 29 September to 3 October 2010. It was the 77th UCI Road World Championships and the first time that Australia had held the event. Coincidentally, the title's defender at the road race was an Australian, Cadel Evans, who has a home in Barwon Heads, only 20 km from Geelong. The time trial and most of the road race elements of the 2010 UCI Road World Championships were staged in Geelong, while the final event, the men's road race, started in Melbourne and went to Geelong, where it finished after 11 laps of the road-race circuit. The events were spread over five days, allowing recovery time for those riders wishing to take part in both the time trial and the road race. The first event, the men's under-23 time trial resulted in a win for Taylor Phinney, who went on to share third place in the U-23 road race, which was won from a group sprint by Michael Matthews of Australia. In the women's events, Olympic silver medallist Emma Pooley became the first British rider to win the time trial, and Giorgia Bronzini, bronze medallist in the 2007 championships, won from a three rider chase group. Switzerland's Fabian Cancellara successfully defended his men's time trial title, achieving a record fourth win: and in the final, showpiece event, Thor Hushovd became the first Norwegian winner, and a bronze for Allan Davis clinched top place in the medal table for the hosts. 444 cyclists from 49 national federations participated. The number of cyclists per nation that competed is shown in parentheses. ^ "2010 Cycling". Archived from the original on 10 July 2009. Retrieved 22 September 2010. ^ "Norway's Thor Hushovd claims world road race crown". CNN. 3 October 2010. Retrieved 4 October 2010. Wikimedia Commons has media related to 2010 UCI Road World Championships.